"I have been a patient at Durant Physical Therapy for almost three years. This is obviously a prolonged and significant amount of time. I had surgery in 2012 to remove scoliosis. Having a major curve at the bottom of my spine was causing dire pain and associated distress. When my very specialized surgeon asked where I wanted to go for therapy, I had an immediate answer based on working with Brad Harper and his associate Lance Patterson in previous years. The reason then was I severely broke my right leg in three places with two fractures. My orthopedic doctor was stunned at how expediently I was able to heal and didn’t even need a bone stimulator. Brad and Lance worked with me, and I learned how to walk again without the slightest limp. When you are very familiar with the expertise of these two men, you know that’s the place to go! Following the spinal surgery, I was in a wheelchair. Brad did the initial evaluation to decide just what therapy I would need. I noted how thorough he was with the examination plus he asked a lot of pertinent questions. I knew I was in for a ‘long haul’ yet felt encouraged with his unwavering optimism. One of Brad’s strengths is his dynamic personality accompanied with a broad smile. I was happy to have therapy underway knowing I was where I needed to be. I have felt secure in the exercise schedule that was planned specifically for me with constant monitoring by two highly skilled therapists and their assistants. Noone is idle; the comraderie among personnel is refreshing. The professional leadership and personal compassion evidenced could not be surpassed. Challenge was placed in front of me, and I tackled it with gusto. Extrinsic motivation has helped me to reach goals; I actually enjoy going to Durant Physical Therapy. My strength, balance and stamina have increased. I no longer have any back pain; however, I suffer from sciatica and most especially nerve pain in my left knee. This is not related to my back. My major goal is to regain a normal gait. I firmly believe I can achieve this by staying committed at Durant Physical Therapy." "Thanks, Kathy, for scheduling and handling the billing of my treatments. Thanks, Amy, for your sweetness and compassion as you took the time to explain what was going on with my knee. I will miss the 'brudder' stories. Julia, thanks for being the cheerleader and encouraging me. I enjoyed all the non-therapy conversations we had. Jessica, thanks for your kindness and encouragement with my therapy and not letting me give up. Good luck on your marriage in the spring. Thank you, Brad, for being so thoughtful and compassionate during my therapy. I will certainly recommend your ofice to anyone needing therapy. I could feel the Love of God when I was in your care." "The employees of Durant Physical Therapy are always very helpful and nice. They are always very professional and give me optimum care." "My flexibility has improved and you've taught me how to help myself to a better quality of life." 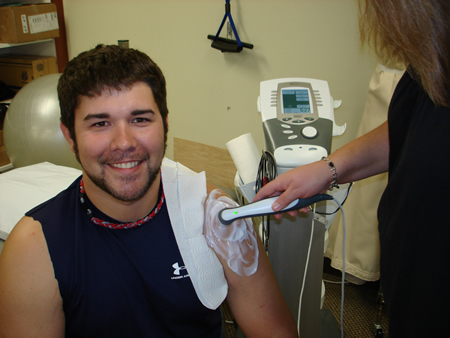 "I have been a client of Bradley Harper's Durant Physical Therapy due to a broken wrist. Because my whole arm was somewhat immobilized, my fingers, palm and upper arms were affected more than one would think. Bradley has been most concerned and worked diligently to make wrist and all my fingers and knuckles to be as flexible as possible and give me back the mobility of my former state. I am working hard also as I only see the physical therapist 3 times a week, but every time I go in Bradley, Kathy, Amy, Julia and Jessica make my visit interesting with lively conversation and laughter while I work on my exercises so the time passes quickly and one feels as if you are visiting with long time friends. I recommend Durant Physical Therapy as a place to get your muscles and joints back in working order. They are a compassionate and understanding staff that is truly concerned about getting you back to your former healthy state. Thank you, Bradley. I appreciate you and each of your staff members."